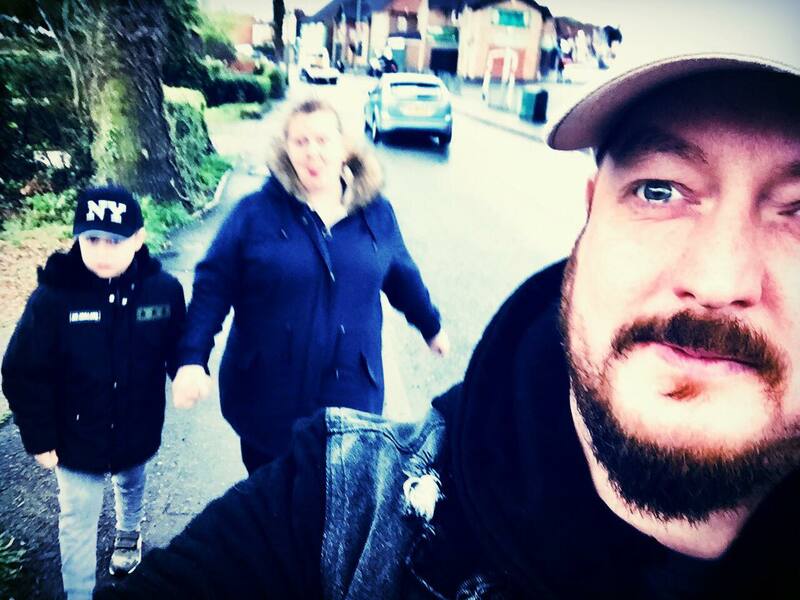 Aiden and Grandma going for a walk to the shops. Grandma came for a visit today, and almost as soon as she arrived, Aiden was getting his shoes and socks 😍 He wanted to go out with Grandma. He more than likely wanted to go for a sleepover at Grandmas, but as she is working tomorrow. That was not an option, so we spent a long time politely ignoring his gestures of shoes and going out. But the persistent little bugger he is. He had a wry smile on his face and a look of determination in his eyes 😏 'You will take me out' He said in his best Jedi Non-verbal mind trick way. We were standing our ground, and not putting his socks and shoes on for him because that would be game over! if we did. He sat himself down next to Grandma. Kept looking over at her and me. And very patiently and with much struggling. He put his own socks on! 😮😍🤘Aiden then went into a happy stim frenzy. He knew he'd done something BIG! It didn't finish there either. He also sat and figured out his shoes. fixing the Velcro and making sure they were the right feet. Once they were perfectly placed on his feet, he stood up and faced and bounced in front of Grandma. He chose his snacks from the shop, and is now happily sat there. Grandma was free to go home without him piling on the guilt. He is happy now. 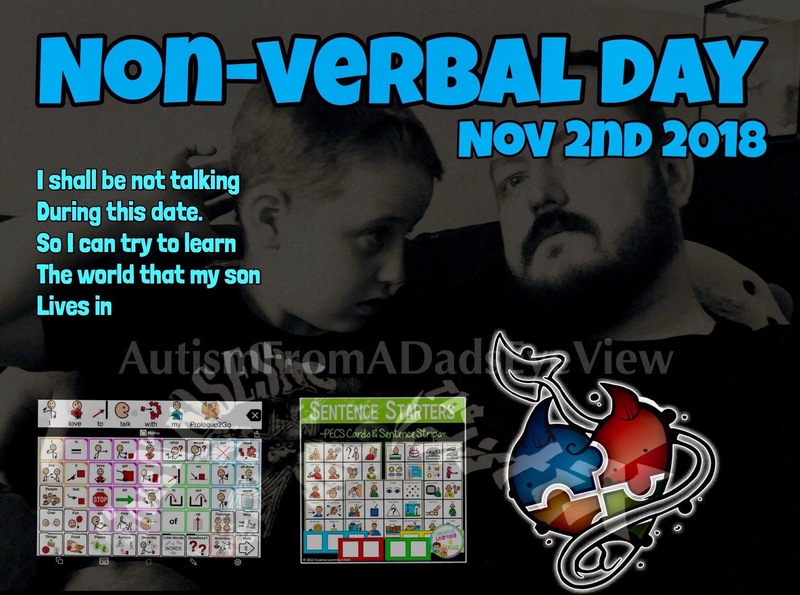 How many of you would be willing to actively take part in a non-verbal day? 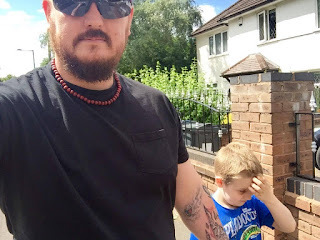 I did one the other year, to try and better understand my son, and to see if I could feel the struggles he goes through daily..... Boy I did. I gave myself all the aides that he has to his self. Pecs, talking tablet etc.... As well as body language and hand holding. I documented everything I have never noticed before. And how not being able to talk makes you act differently. And how incredibly hard it is. It opened my eyes. And I saw how my son does things and why. And I understood a little bit more. I hold my sons hand, and always will. When I'm out with Aiden, I hold his hand. Because I love him. He's my son. But also as a safety measure, as he has been known to drop and roll at any time. It also makes him feel safe. He likes holding my hand. We can let each other know which direction we are going by turning our hands. Steer left to go left, right to right. It gives him the information as to where we are going. It helps him remain calm. It is another form of non-verbal communication we have together. He is 9 now, and he is growing older day by day. But the need to hold his hand will remain. I will be there for him. We will walk side by side. Hand in hand. Father and son. For as long as he needs me too. And if any foolish person should ever dare to stare or say something very regretful. 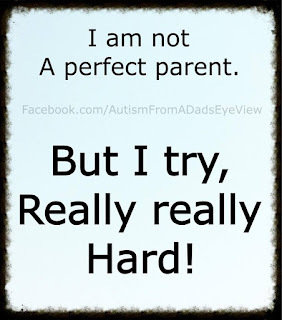 I am not a perfect parent. 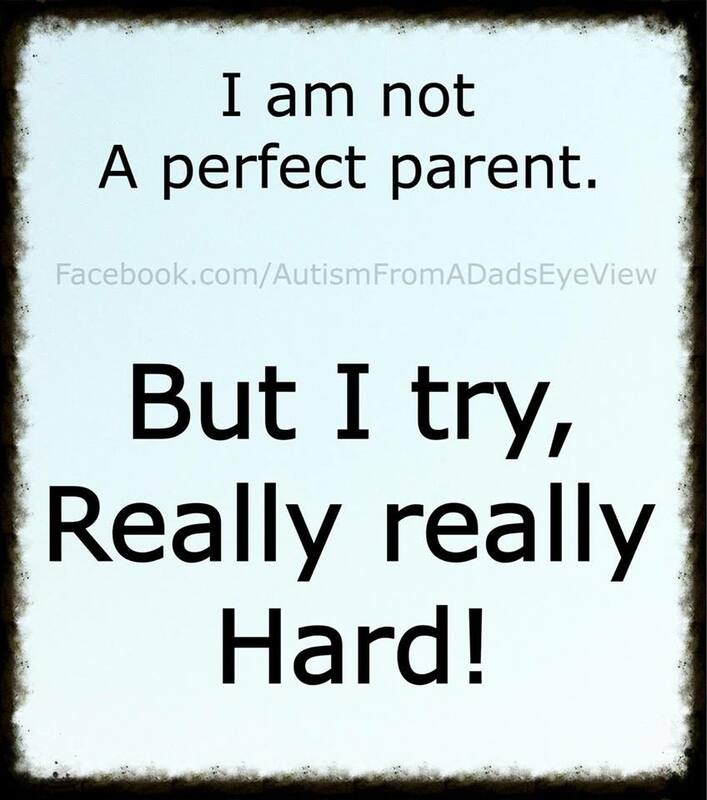 But I try, really really hard! Having 3 children. 2 of them on the ASD spectrum, and at different ends to each other. I sometimes overlook Connors specific signs of a 'meltdown' coming, because Aiden is a far bigger presence in our house! Connor can be spoken to and respond. But sometimes I forget that he also can't fully control the anxieties building up inside him! We were trying to do his math homework. But we couldn't even get to the table... A fight broke out between me and him. He went on raging about random stuff! and I was there 'demanding' he sit and do his work. I saw this was going in a bad direction, and sent him off to do his calm down techniques... this was not working either! So I tried the distraction technique - jokes and tickles. Yes he laughed and smiled, but the rage inside him was still there. We both lay on the floor at the bottom of the steps, heads together. I was just trying to bring his emotions down to a calm level. He was just trying to tell me how 'angry inside' he was feeling. And when we got to the point of civil conversation, I suggested we go do the math homework.......... BANG! he's off again. Deep pressure hugs from me this time. He turned and said 'I'm going to my room' OK I said, but not to play! NO he said, I just want to relax. After an hour he came downstairs, blurry eyed but happy. Gave us all a love and talked about stuff. We sat down. Did the homework, And the rest of the day has been lovely! So. Yeah. I need to work a bit more on my parenting. And will for as long as I need to. and then some more. Why we have to do things differently from other families. Firstly let me point out the graphic in the picture. Aiden is in the lower corner of the pic, getting his Stim on, He is not upset or distressed, just using his physical body to bring his stimulations to a more comfortable level, See he is aware that we get dressed up, decorate and do things for special occasions. He enjoys the atmosphere, but finds it harder to participate in the way that others do. Me and Mommy have learned over the years, what works and what doesn't with our three children. Sometimes we make mistakes.... BIG mistakes, and end up with meltdown central station at rush hour! But we learn from them. We don't feel that Aiden is 'missing out' because forcing him to participate would just be wrong. If he shows signs in the years to come that he wants to take part, we will give him that opportunity, and if it goes wrong so be it. 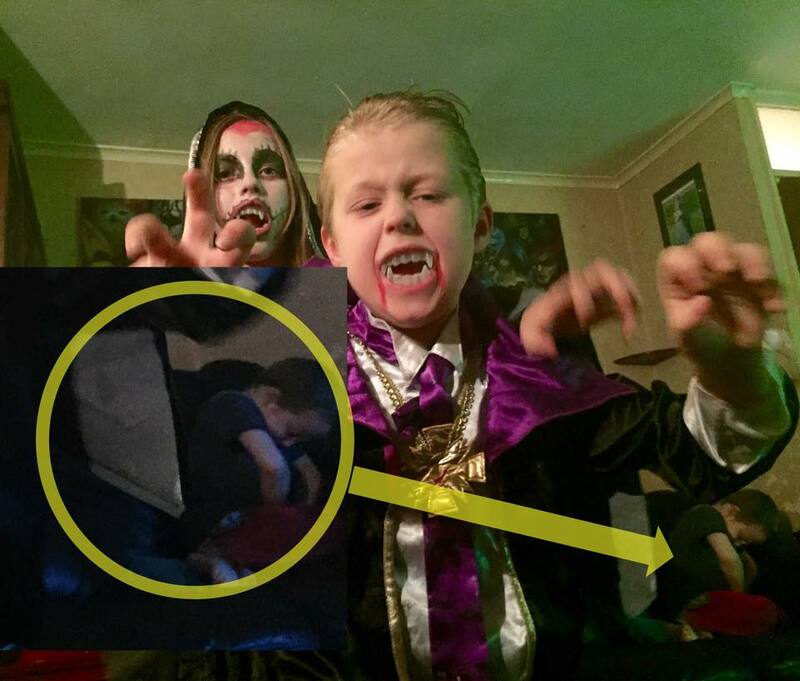 I'm explaining this today as it's Halloween and will be more understood by others who may face similar situations, or also question other families lack of involvement. And this is the way that me and my family do things, others may have a different approach. And it's not bad, sad or wrong, It is just the way it is. Hey Dad's. Don't Give up!! 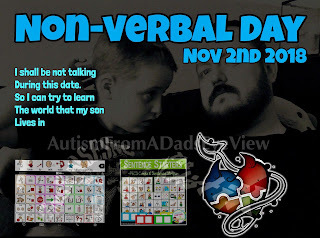 I am a dad to 3 Children, and 2 of them are my boys who are on the autistic spectrum! I feel very sad when i see posts from families saying that dad's don't 'stick around'??? I mean what the absolute FFFF? But...........even if it is planned or an accident, Becoming a father is the greatest feeling in the world! That feeling you get when you know that 'you are now a dad' is the biggest ego boost anybody can have. But yet! I see and hear that men (cowards) run away from this, Because the child they made doesn't fit their requirements! I know, you were planning to 'play ball, build a car, be best buds and chase the lady's' But sometimes it doesn't go the way you thought. That is no excuse to pack up and leave! 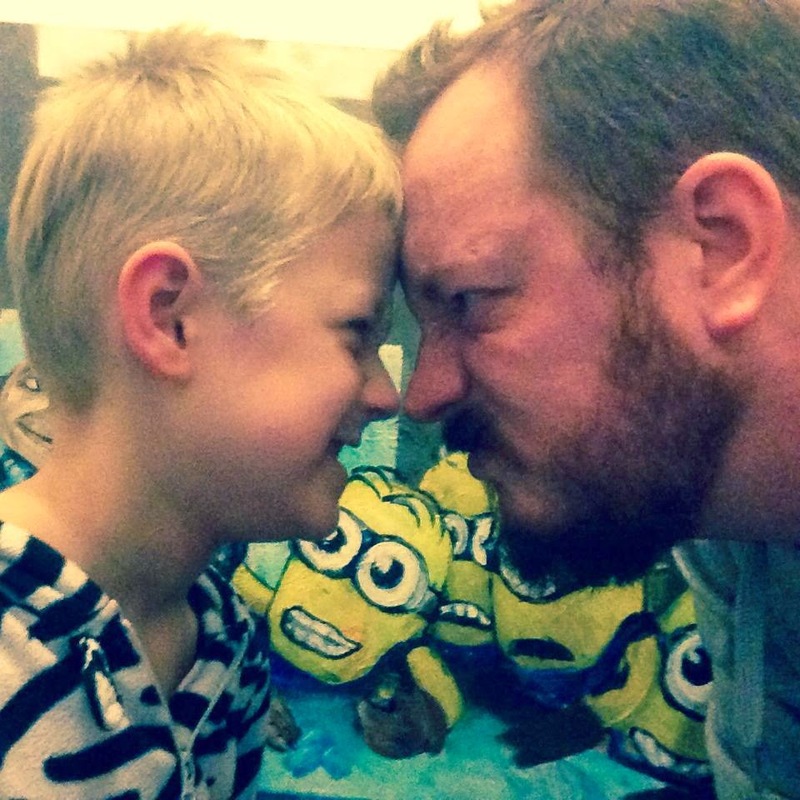 Even if your child is 'not normal' (eaurgh, I vomit in my mouth when i type this!) I mean seriously! that is your own flesh and blood! You have a responsibility to make and create the best out of them that you can. And running away! well that that's just pathetic!! You will miss out on the best feelings in the world. And you will never get the satisfaction of having being there! I have been there since day 1 with my kids. And I would never ever change that for anything! Even when I am woken up at 4am to the sounds of 'mmmnnaaahhh' and when I have to stand over my son in the middle of town to stop him from rolling onto the road! Because what they give me and what I give them is a feeling that money can't buy. The small steps, or Giant leaps they make, I can see my influence in there (no matter how small) And that feeling cannot be bought or faked! And on the plus side..........When else is it acceptable to eat ice cream for breakfast? if not to get some fruit into your child? The battles we have, the journey we take, there is no comparison to the joys we encounter! So......Man up! and just deal! because if you don't. You will never know how powerful a 'hug' or 'kiss' can be! 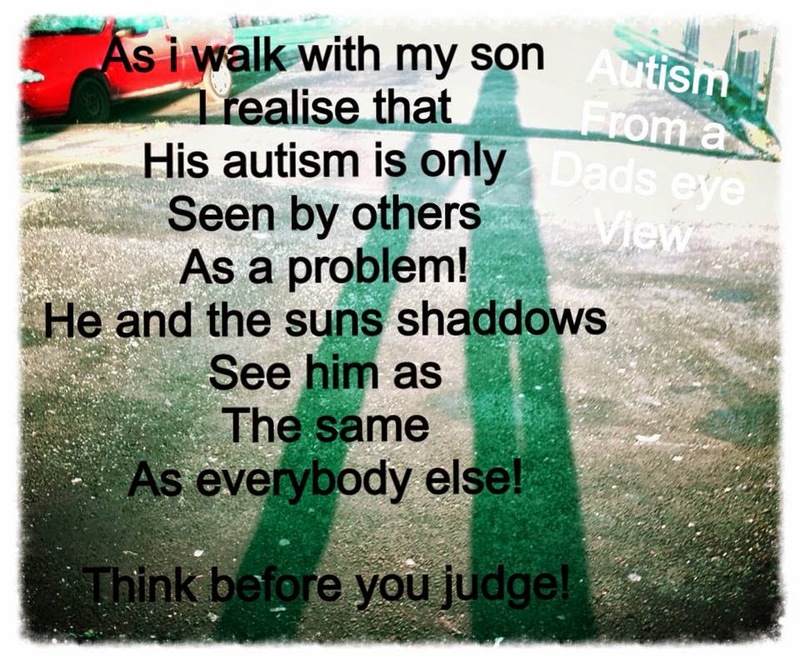 Throughout my time as a dad to two autistic boys, both on different ends of the spectrum from each other. I have learned many things I never even thought about in my life. Some of these things are throw away lessons, others will stay with me through life. Food ranks highly in this list, and the small things are sometimes more important than the big things. 2 - If the blankets aren't straight they wont be good enough to sleep on! 8 - If in doubt? ask Connor, if he has an answer it is mostly correct. 11 - sleep is for the lazy and weak. 12 - Cuteness and charm can and will get you out of many a sticky situation. 13 - Sitting in mud, sand, chalk, yogurt is all fine, But a spot of gravy or a crumb of bread on the plate where it is too near another food item BAD, very bad, run and scream bad, new dinner bad! 14 - It's not a 'mess' it is methodical placing of toys, cushions, and crockery. 15 - Changing agreed plans is bad, and should be dealt with in the ways of a high court. Fines are usually issued to the contract breakers. 16 - Be open to any and all people you meet, for the sooner they realize the boys are running off a different program to us, the sooner they accept and embrace these quirks. 18 - Coffee is for adults for a reason!!! 20 - Grow a beard! There's never any shaving foam left anyway!